Hands-only CPR is CPR without the mouth to mouth breaths. This procedure is deliberately tailored and simplified so that persons caught in a medical emergency are able to promptly respond without hesitation. 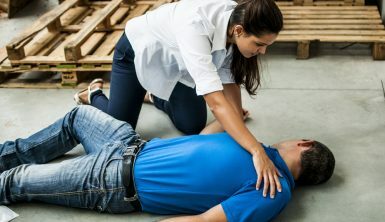 It is ideal for bystanders who see a teen or adult unexpectedly collapse at home, at work or in the street, and environments denoted as out-of-hospital settings. The following is an in-depth exposition of the steps to follow in case of cardiac and respiratory emergencies. In need of CPR certification? There are a couple of precautions to consider before intervening to give medical attention to a casualty. Survey the immediate environment. Scan the scene and remove all objects that may potentially be hazardous material. For instance, the casualty may have shattered glass during the fall, so ensure all fragments are cleared promptly and can cause no harm to you and the casualty. Tap or shake the casualty’s shoulder to monitor a response. Also ask simple questions such as “Are you okay?” and see whether the casualty will answer. It is futile to begin chest compressions on a casualty who is already breathing. To check for breathing, position the victim with his or her back flat on the ground chest up and head back. Scrutinize whether the chest is falling and rising as it would if one was breathing, listen for breathing by placing your ear close to the victim’s mouth, or feel for breathing on your cheek. Placing one hand on the casualty’s forehead, gently tilt their head back, lifting their chin with two fingers of the other hand, tucked under their chin. This opens their airway. The duty of a bystander is to offer emergency care to a casualty before professional medical responders arrive at the scene. If you have a phone with you, call the emergency contact of your country. Proceed to tell them exactly what transpired and the information you have gathered about the casualty. The dispatch crew will ask you questions about the incident, thus do not be reluctant to cooperate with the dispatcher. Believing that conversing with the dispatcher is a waste of time is misguided. In most cases the dispatcher will aid with CPR instructions. Begin compressions – If the victim is unresponsive, proceed to administering hands-only CPR. Position the casualty on his or her back in a firm place. This ensures you have full access to the chest cavity and enough room to commence the administration of the chest compressions. Kneel next to the casualty’s shoulder and neck. With one hand, put your palm’s heel at the core of the casualty’s chest and place the other hand on top of the first. Interlock or rather lace your fingers together. Adjust the orientation of your body so that your shoulders are directly above your hands and your elbows are locked, keeping your arms straight. Use the heel of your hand and body weight to push the breastbone firmly down, making at least a 2 inch depression on the chest cavity, and then release. Administer compressions at a rate of 100 to 120 strong pumps per minute. This roughly translates to about two compressions per second. Keep pumping until you see conspicuous signs of regaining consciousness such as coughing, eyes opening and movement, normal breathing, speech or deliberate movement. Additionally, continue with hands-only CPR until an EMS professional or trained responder arrives at the scene to take over. Once the casualty has regained consciousness and is breathing normally, place them in the recovery position until professional help arrives. Imagine you are at a restaurant, at the airport ready to board your flight, or maybe at work gathered at the conference room, ready to commence your meeting, or just maybe on a crowded street in your neighborhood. Now imagine the person next to you holds their chest squirmishly and crumples to the ground with a loud thud. What do you do now? Certainly, the first thing that comes to mind is CPR, the emergency procedure paraded in most if not all medical dramas. CPR is an emergency medical procedure that primarily encompasses the coupling of chest compressions and manual rescue breaths or artificial ventilation, in a bid to restore blood circulation and breathing in a casualty who has suffered cardiac arrest. The chest compression recommendations dictate that adults require compressions between 5cm to 6cm deep and at a rapid rate of about 100 to 120 compressions per minute. This rate is synonymous with the tempo of the famous Bee Gees song ‘Stayin’ Alive’. Although rescue breaths may be administered to the casualty by the attending respondent, current recommendations emphasize quality chest compressions over artificial ventilation, especially with untrained bystanders. Ergo, there is a growing urgency on hands-only CPR. Traditional CPR guidelines include in-depth procedures for facilitating artificial ventilation through the administration of rescue breaths or what is colloquially denoted as mouth-to-mouth. CPR as a medical rescue technique has always fallen within the acronym CAB – compressions, airway and breaths to help persons remember the steps. However, latter-day publications are endorsing a new way of administering CPR that fundamentally focuses on chest compressions. This trimmed CPR technique is denoted as hands-only CPR. This technique is simple and tailored to accommodate the limited medical knowledge of laypersons. While traditional CPR encompasses the administration of rescue breaths, preferably two rescue breaths after every set of 30 chest compressions in teens and adults, hands-only CPR strips this technique to only fast, hard and continuous chest compressions until resuscitation or the arrival of trained medical personnel. The technique for administering chest compressions remains the same. The respondent is to place the heel of one palm over the breastbone with the other hand on top and fasten his or her fingers together. Then using their body weight pump compressions two inches deep at a rate of two pumps per minute. Another key difference between traditional and hands-only CPR is that the latter is summarised into two simple steps that laypersons can easily recall during medical emergencies. The procedure can be summarised into calling 911 to contact dispatch for response and guidance, and performing the compressions. This technique is fairly simple that no formal medical training of the procedure is required. However, it is still advised to take training courses offered by local hospitals to garner a holistic understanding of the skill and increase tknowledge on the use of emergency rescue techniques. A bystander starts compressions over the heart of the casualty, somewhere along the breastbone and pumps in a regular rhythm. The rhythm widely recommended to help understand the pace of the compressions is that of the famous song ‘Stayin’ Alive’ by the Bee Gees. This is basically all a bystander is required to do until the casualty comes to or until medical responders arrive at the scene and intervene. The simplistic nature of the technique has many ruminating over the effectiveness of this technique and just how far it helps maintain brain and heart tissue perfusion. Well, chest compressions have a significant physiological effect on the body of an unconscious victim or one under cardiac arrest. Consciousness is maintained by the collaborative efforts of three organ systems in the body. Namely, the circulatory system that includes the blood and blood vessels, the respiratory system that includes the lungs, and the central nervous system that encompasses the brain. Simply, the lungs imbue blood with oxygen, and the heart pumps the blood to the rest of the body including the brain, which requires oxygenated blood to keep a human being conscious. Prior to unconsciousness the bloodstream of a casualty already contains enough oxygen to sustain life up until a certain time, which is usually several short minutes. Chest compressions circulate oxygen that is already present in the blood of an unconscious casualty. This supplies much-needed oxygen to the brain and somatic cells preventing cell death. Cells starved of oxygen trigger a cascade of detrimental chemical reactions inside cells that leads to cell death, referred to as necrosis. Some studies postulate that hands-only CPR offers an uninterrupted flow of blood, thus oxygen to the brain, and it therefore increases the odds of a patient making a full recovery. Additionally, research shows that supplying oxygen to the bloodstream so soon after collapse decreases the likelihood of damage. Hands-only CPR keeps the oxygen levels low in the initial minutes after the heart stops. Hands-only CPR seems to have some behavioral ramifications as well. 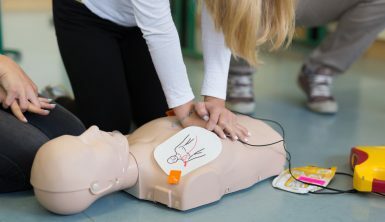 Several CPR campaigns have registered that lay bystanders are now more confident and willing to spring into action with the new hands-only CPR recommendations. This is attributed to the simplistic nature of the technique that only encompasses a two-step procedure with easy instructions and the fact that mouth-to-mouth contact is not necessary. Many medical professionals agree that it is better to do something rather than nothing at all, and the few minutes before professional help arrives is crucial in determining whether a casualty makes a full recovery. Chest compressions are not always recommended for all casualties who lose consciousness and in all medical emergencies. For instance, hands-only CPR is only effective in teens and adults. In medical emergencies that may involve babies or children, rescue breaths may still require administration and preferably by a trained professional. Moreover, studies that support the sole use of chest compressions for emergency resuscitation only used teens and adults to measure the effectiveness of the trimming procedure. Not all medical emergencies warrant the use of traditional CPR. In cases of cardiac arrest, unconsciousness with difficulty breathing, hands-only CPR is recommended. Notwithstanding, medical emergencies such as near drowning still require the administration of rescue breaths to resuscitate a casualty. Ideally, hands-only CPR is tailored for bystanders who are hesitant to perform CPR due to the invasive nature of mouth-to-mouth. It is also ideal for bystanders who have no knowledge of the correct ratio of chest compressions to rescue breaths. How effective is hands-only CPR? Researchers have heavily delved into the investigation of how efficacious hands-only CPR really is. Research has been published extensively in various journals from all over the globe, supporting claims that hands-only CPR is just as effective as traditional CPR. The research conducted included dispatchers instructing bystanders to perform either hands-only CPR or traditional CPR, in equal measure. It was established upon further scrutiny that the rate of survival and brain damage between the two groups was not significantly different. This roughly translates to mean that the results from both groups are remarkably similar. Statistics from the state of Arizona postulates that dispatchers in collaboration with lay bystanders have been able to save two-thirds of the cardiac arrest casualties who have been called in. This is due to the hands-only CPR resuscitation attempted by bystanders. Notwithstanding, traditional CPR is still the only acceptable form of resuscitation especially among medical professionals. Wide research and studies still need to be conducted to convince medical professionals that rescue breaths can be cut from resuscitation without compromising the odds of survival. Many medical professionals support that hands-only CPR serves as an alternative to traditional CPR, especially for lay bystanders or persons not comfortable with the contact mouth-to-mouth entails. The quick takeaway message is that, even if you have no formal training in CPR, administering hands-only CPR as elucidated above can help save a life. It is fairly easy to muster these steps and procedures. 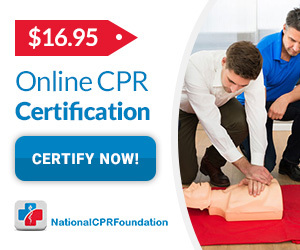 Interested in traditional CPR certification training? What are the Differences Between BLS and CPR?